A widespread belief says that in June 1889 the pizzaiolo Raffaele Esposito, Pizzeria Brandi's chef, invented a dish called "Pizza Margherita" in honor of the Queen of Italy, Margherita of Savoy, and the Italian unification, since toppings are tomato (red), mozzarella (white) and basil (green), representing the same colors of the national flag of Italy. The legend of pizza Margherita is considered a false history, as a pizza made with the same toppings was already present in Naples between 1796 and 1810, although it probably was not called "Margherita". 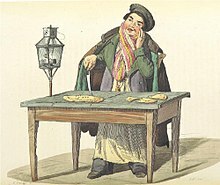 In 1830, in the book Napoli, contorni e dintorni, written by Riccio, it was described as a pizza with tomato, mozzarella and basil. In 1849 Emanuele Rocco recorded different pizza toppings like basil, tomatoes and thin slices of mozzarella; the mozzarella was thinly sliced, and arranged with a flower-shape over the tomato sauce, along with the basil leaves: this may be the real origin of the name Margherita (meaning daisy). The most ordinary pizzas, called coll'aglio e l'olio (with garlic and oil), are dressed with oil, and over there it's spread, as well as salt, the origanum and garlic cloves shredded minutely. Others are covered with grated cheese and dressed with lard, and then they put over a few leaves of basil. Over the firsts is often added some small seafish; on the seconds some thin slices of mozzarella. Sometimes they use slices of prosciutto, tomato, arselle, etc.... Sometimes folding the dough over itself it forms what is called calzone. Wikimedia Commons has media related to Pizza Margherita. ^ "Mozzarella vs fiordilatte. La pizza non può più raccontarti una bufala". ^ Arturo Iengo (2008). Cucina Napoletana: 100 Recipes from Italy's Most Vibrant City. New Holland Publishers. p. 126. ISBN 1-84537-989-6. ^ Angelo Forgione (2013). Made in Naples. Magenes. p. 195. ISBN 978-88-6649-039-5. ^ "120 anni della pizza". La Repubblica. ^ a b c Francesco De Bourcard. Usi e costumi di Napoli e contorni descritti e dipinti. II. p. 124. ^ Angelo Forgione (2013). Made in Naples. Magenes. p. 194. ISBN 978-88-6649-039-5. Francesco, De Bourcard (1866). Usi e costumi di Napoli e contorni descritti e dipinti. Naples.